One of the newly installed bicycle lockers at the Jeffrey Park and Ride lot. The California Department of Transportation (Caltrans) undertook this much-needed expansion of the Jeffrey Road Park and Ride lot in Irvine to open this commuting option to more Orange County residents. First built in the early 1990s with 225 spaces, the $1 million expansion nearly tripled the number of spaces to 595. The California Department of Transportation (Caltrans) undertook this much-needed expansion of the Jeffrey Road Park and Ride lot in Irvine, which has been consistently at capacity for several years. Expanding the Park and Ride lot allowed for more commuting options for Orange County residents, which alieves congestion on the State Highway System. First built in the early 1990s with 225 spaces, the $1 million expansion provided an additional 370 spaces, increasing the lot to a total of 595 spaces. What helped make this an optimal and viable project was the open space located adjacent to the original Park and Ride lot. The location of the existing Park and Ride lot adjacent to the I-5 and next to the southbound off-ramp makes the use of this Park and Ride lot convenient. With a lot of perseverance, this project took the coordinated effort of Planning, Advanced Planning – Project Studies Unit, Project Management and Construction. While other Caltrans districts relinquish Park and Ride lots to other agencies due to the significant underfunding of the program, District 12 is proactively working to expand the Park and Ride Program. 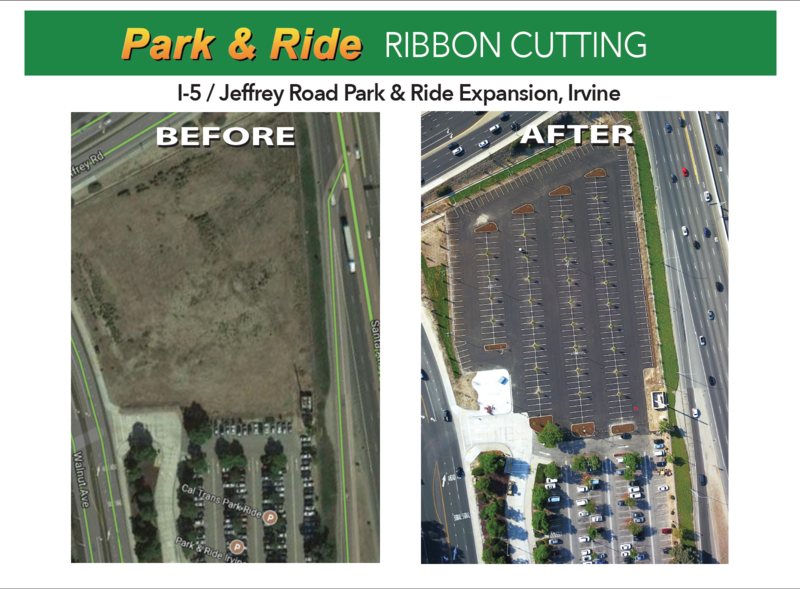 The expansion of the Jeffrey Road Park and Ride lot improves mobility options, enhances the amenities for the City of Irvine and above all, removes vehicles from the State Highway System. As a multimodal lot, the Jeffrey Park and Ride location encourages intermodal connectivity. 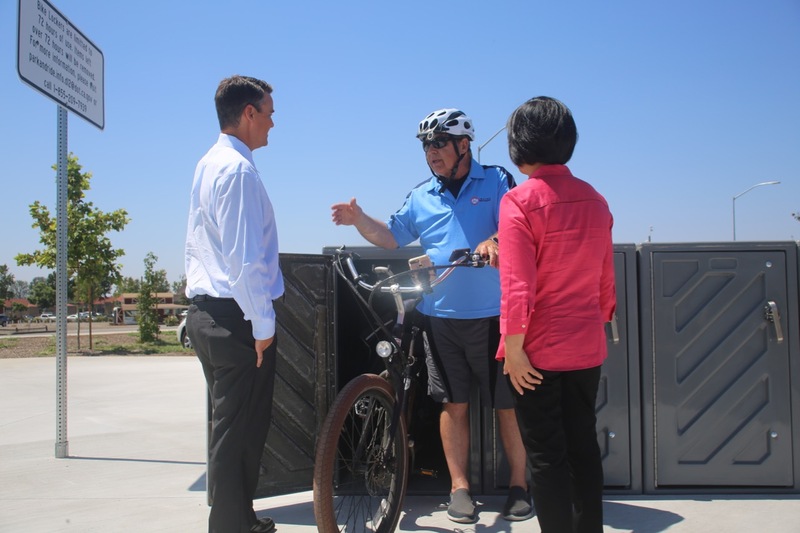 Bicycle lockers are provided for cyclists, especially important given the close proximity of connections to the Jeffrey Open Space Trail. With a bus bay, integration with future transit connections are facilitated. Future amenities will include electric vehicle charging stations and solar panels. With the location adjacent to the I-5, the visibility of the vanpool vehicles parked at the Jeffrey Road Park and Ride lot is a testament that Park and Ride lots are convenient, increase the movement of people in the area, and are an effective tool to reduce vehicles miles traveled and greenhouse gas emissions. Caltrans undertook this much-needed expansion of the Jeffrey Road Park and Ride lot in Irvine to open commuting options to more Orange County residents. First built in the early 1990s with 225 spaces, the $1 million expansion nearly tripled the number of spaces to 595.